Right lower photo shows the kiddies group B, who wins in the parlor game, “trip to heaven”. Walking and dancing around when the music stops, each grab a chair and sit on it. The lone winner receives cash and minipack as prize. 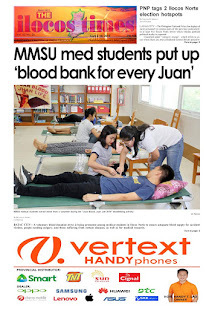 However, all participants receive the same prize. Note: Not in photo is the dance contest monopolize by the elderlies, receive minipack prize. 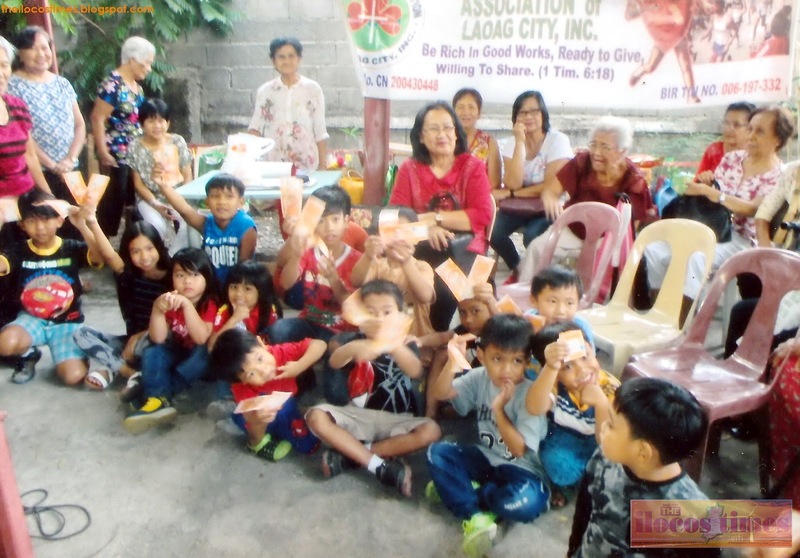 The kiddies with joy in their hearts as they wave the paper bills up in the air Christmas gifts from Santa Claus Ms. Rosita Velasco Chea, sited at center. Right top photo shows group A, consisting the elderlies who win in the “Singing contest”. 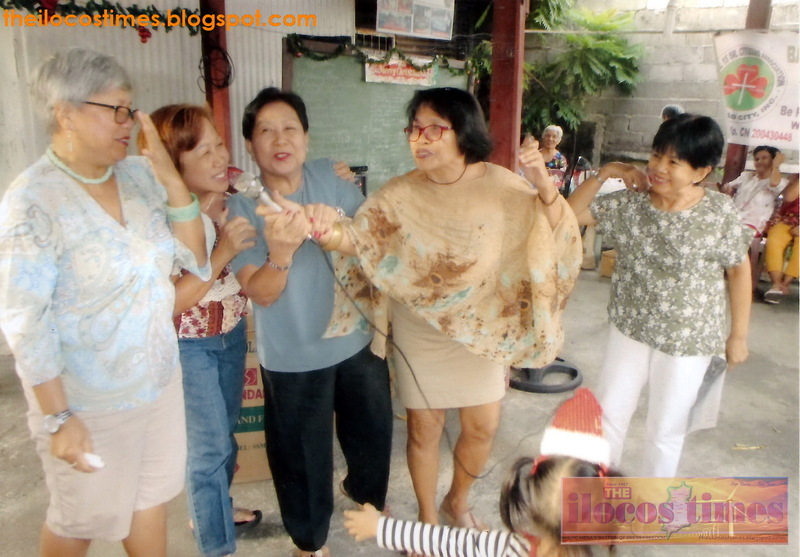 Note how happy they are in singing the winning song “agragsak kan ditoy lubong”, with their tune “Joy to the World”. They receive minipacks as prizes. Left lower photo shows the appokos group B trying their best to sing together “we wish you a merry Christmas”, receives cash and minipacks as prizes. 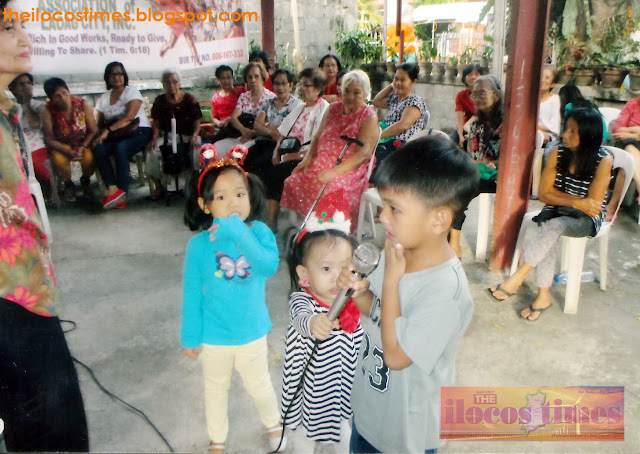 The Barangay 15 Senior Citizen Association of Laoag City celebrated Christmas on December 16,2017 at the Senior Citizen Center, with more than 80 neighbors, kids and guests attending. In celebrating Christmas, we remember that the birth of a tiny baby in the little town of Bethlehem was the greatest event of history, and that civilization still marches forward for all the words of kindness, appreciation, and love spoken to us. Our being together last Christmas in serving others may be a source of continued inspiration. The coming of Jesus Christ, is a blessing to all mankind, to guide us, teach us, strengthen us, till we become such a person that thou would’eth have us be, pure and gentle, truth and open minded, brave and able, courteous and generous, dutiful and useful, and make each day Christmas Day. 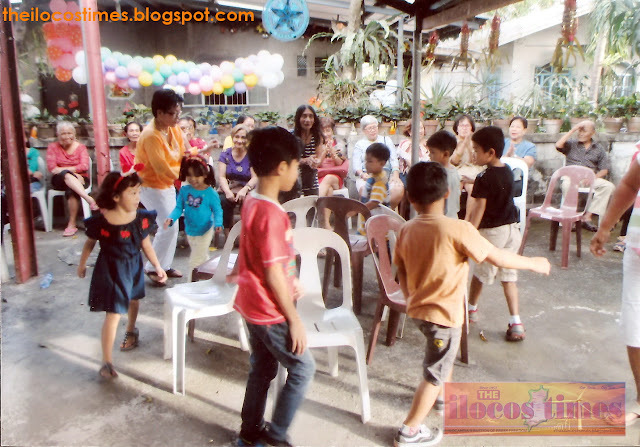 This Christmas, the kiddies of barangay 15 and neighbors were the guests who all received cash and minipack as gifts. Highlights of the occasion were the distribution of gifts to all the kids by Rosita Velasco Chea, an OFW from Singapore, bringing joy into their hearts. The singing contest both for the elderlies and kiddies, winners in both categories receive gifts packages. The parlor games contest both participated in by elders and kiddies, likewise, winners receive cash and minipacks. Elderlies monopolized the dancing contest, automatically receiving minipack gifts. The Christmas message was delivered by Mariano Eugenio, the eldest lolo-member who said: “Christians that knoweth to do good and doeth it not, to him, is a sin. That is, no man can stand in the midst of a needy world, a neighbor, a community like ours, and do nothing to meet those needs without guilty in the sight of God. We will be condemned because we failed to do our duty to serve those in need. That is to live in the midst of men and women that are hungry and thirsty and lonely, and yet empty handed and empty hearted”.